Who doesn't love Buddy the Elf from the holiday classic movie, Elf? This writing assignment combines fun, creativity, and good ol’ fashioned writing practice. 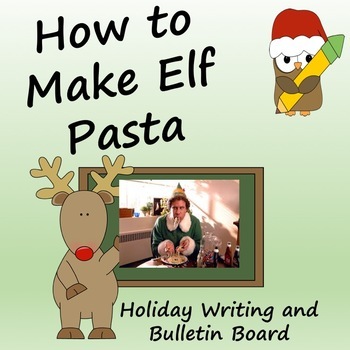 It’s a perfect writing activity for the holiday season when you still want to keep your students engaged and learning, It also provides fun learning extensions, and a bulletin board to showcase students’ writing and Elf pictures. In this activity, your students will model How-to writing based on the famous pasta dish created by Buddy in the movie.. Your students will love creating and writing about their own wacky pasta dishes!. In addition to lesson ideas and tips, a student handout, elf themed graphic organizer, writing checklist, recipe cards, writing sheets, fun bulletin board elf hats and sign are included. Students will have a sample writing assignment to model their own writing. I recommend creating a 4 page writing packet to distribute to students, but pdf's could also be projected or shared through google classroom or other electronic platform. 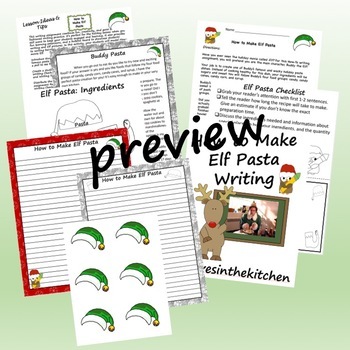 Your students will have a blast creating their own version of the famous Buddy the Elf pasta! Promote authentic writing and keep your students engaged during the busy holiday season!